← La imagen simbólica del ferrocarril y los puentes. Lluvia, vapor y velocidad de Willian Turner. 1844. Óleo sobre lienzo. 91x 122cm. The National Gallery. Londres. Inglaterra. 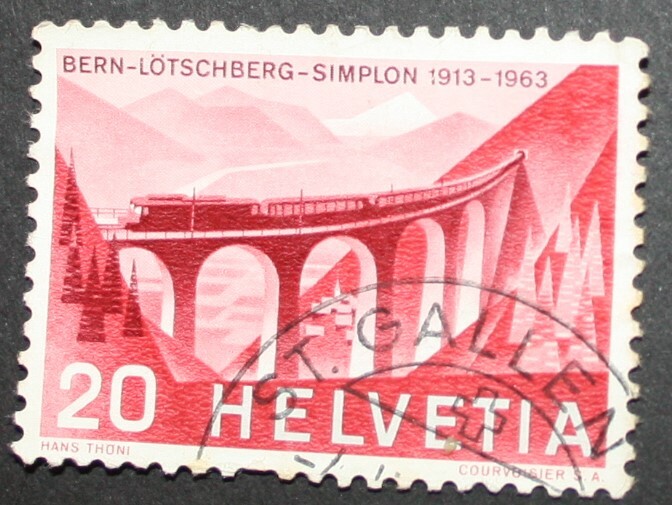 Swiss stamp of the Luegelkinn viaduct on the Lötscheberg line. Issued on March 21, 1963. Print run 14,875,831. Size 36 x 26 mm. Comb 11 ¾. Multicolored photogravure. Face value 20 Swiss cents. GODO-LUIS COLLECTION, free license with citation of authorship (profesorluisduran). Creative Commons Attribution.